Mark Ginocchio from a recently redesigned Chasing Amazing is back! You might remember him from his two-part look at the Top 10 Spider-Man Battles (Part 1/Part 2). While Mark normally blogs about his affection for all things Spider-Man at Chasing Amazing (and has even started talking about the “Wall Crawler” on the Superior Spider-Talk podcast), Longbox Graveyard is delighted to welcome him back to write about the larger comic book universe. 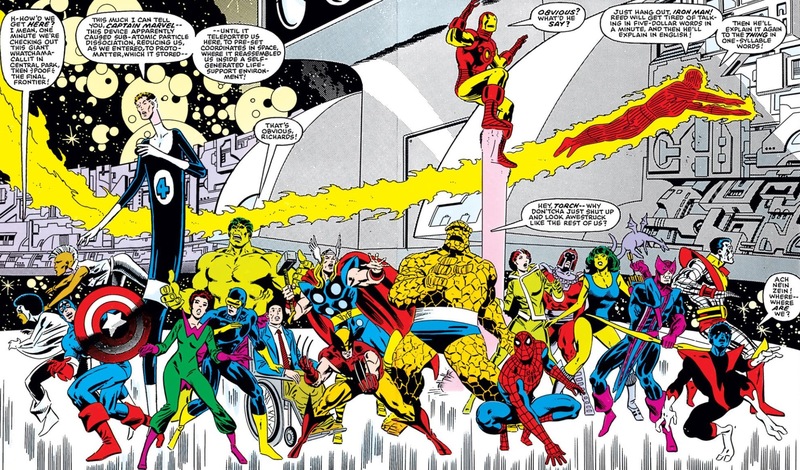 This week, Mark shares his thoughts about the grand-daddy Marvel cross-over event of them all, 1984-85’s Secret Wars series. Take it away Mark! Living in and around New York City for my entire life has made me elitist about certain things … and I hate that. A few weeks ago, my wife and I caught a Saturday matinee of the Broadway revival of the musical Pippin. Upon getting out of the theater, I found myself mumbling and cursing the Times Square crowd under my breath. Really, you’re going to stop foot traffic to look at a cowboy in his underwear? Really, you flew in from Europe just to see the Lion King on Broadway when there’s a dozen other quality shows that are dying on the vine right now due to lack of sales? (No, Spider-Man: Turn off the Dark is not one of those shows that I sympathize with). I hate that I’m like this, because the same kind of snobby elitism has been used against me and my love of certain things in pop culture. In the case of my comic book fandom, that would mean my adoration of Marvel’s Secret Wars series. 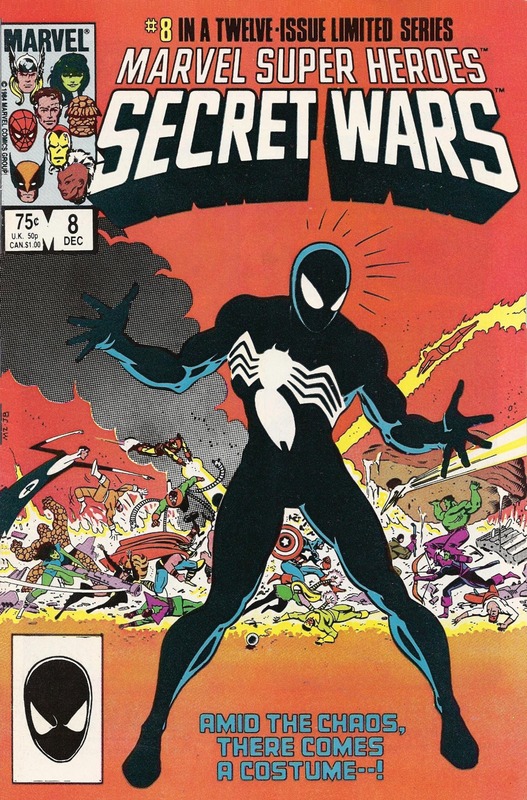 Published in 12 issues between 1984 and 1985, Secret Wars is considered to be the comic book industry’s first true “event,” pitting all of Marvel’s A-List heroes against an assembly of (mostly) A-list villains in a fight to the “death” on another planet that’s simplistically dubbed “Battleworld.” The series is the brain child of then-Marvel editor-in-chief Jim Shooter, certainly one of the industry’s biggest lighting rods, with pencils courtesy of Mike Zeck and Bob Layton. The series is largely considered a joke and a gimmick by anyone who calls themselves a serious comic book aficionado and with good reason – Marvel folks have been unashamed in the fact that the whole event was created to help market a line of action figures designed to compete with the “Distinguished Competition’s” Legion of Super Heroes line. With toys being the driving force behind the series, the plot is mostly flimsy and the characterization of some of Marvel’s most beloved heroes and villains is often quite puzzling. So you would think a guy who pens a column on the internet called “Gimmick or Good” would just rightly dismiss this series and instead focus my energy on the plethora of great comics that were released in the 1980s. But I can’t do that. I love this series. Never underestimate the power of a child’s rose-colored glasses. First, let’s talk about those action figures. I owned them all as a kid and my mother still has my “black suit” Spider-Man figure sitting on the windowsill in her kitchen as a joke after finding the toy buried in the backyard many years ago (I must have been recreating the events of “Kraven’s Last Hunt”). Last year, while watching an episode of AMC’s Comic Book Men and seeing Secret Stash store owner Walt become child-like with glee when a vintage Marvel World board game came into his store, I started to openly reminisce to my wife about the Secret Wars figures. I knew whatever wasn’t buried in the backyard was probably buried in my parent’s basement, and I was likely to never see them again. A few months later for Christmas, the first series of the action figures was waiting in my stocking. My wife found a used set on eBay – surely not for collectors. But I was ecstatic regardless because a piece of my childhood had been preserved. But beyond toys, the series defined the Marvel Universe for me. As a (very) young child, these were some of the first comic books I ever purchased. Yes, my ownership of Secret Wars even predates my first copy of Amazing Spider-Man, which as many of you will note, is my ultimate obsession in the comic book universe. It was from these comics I was able to identify all of Marvel’s heavy hitters: Captain America, Spider-Man, the Fantastic Four, Iron Man, Hulk, the X-Men (the REAL X-Men, i.e. Wolverine, Storm, Cyclops, Nightcrawler, Colossus, Rogue and Professor X), Doctor Doom, Magneto, Kang, Doc Ock, Ultron, etc. etc. etc. While I’ve read and enjoyed some DC stories throughout my lifetime, I have always been firmly entrenched in the “make mine Marvel” camp, and Secret Wars is almost entirely responsible for instilling that affection at an early age. Yes, when re-reading the series today, there are plenty of cringe-worthy moments. Shooter’s choices for some of the characters border on downright bizarre in sections: does the Wasp survive a near-death experience and really complain about her hair and make-up? Did She Hulk just say “tubular?” And why is “Rhodey” Rhodes (filling in for Tony Stark as Iron Man) getting all “what do you mean you people” with everyone? Every issue is basically just building up for another confrontation between good and evil. 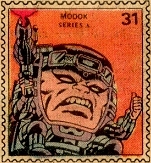 Having Doom eliminate a character as awesome as Kang via Ultron so early in the series is questionable. The Lizard’s presence is a flat-out mystery to me. Was he even a featured Spidey villain during this time? Having Ultron get so easily manipulated by Doom is also disappointing. Irrelevant. 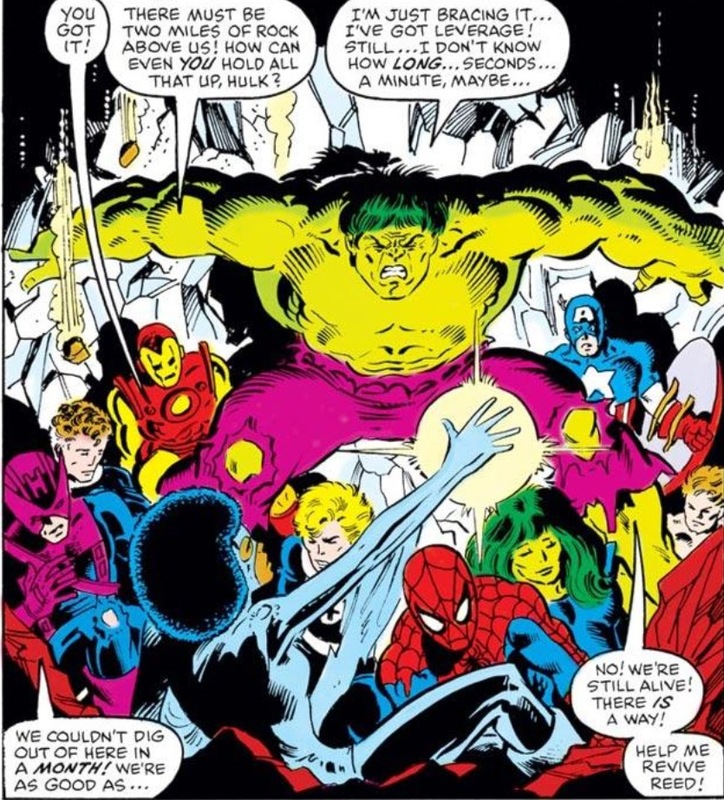 The fights are fun and everyone gets their moment, whether it’s Hulk holding up an ENTIRE MOUNTAIN to save his teammates, or Spider-Man outfoxing the X-Men who operate as a pseudo-rogue third party based on how the heroes mistrust the “mutants.” On the villains side, watching all of these immense egos try to get along is more entertaining than any season of the Real World. Plus, as the series goes along, it becomes perfectly clear that this is Doom’s story, and considering I find Doom to be one of the most compelling villains in comics, I’m alright with that. There might be some panels where there’s just too much going on – too many people – for the art team to effectively draw, but Zeck creates three unquestionably iconic covers in the series’ first, eighth and tenth issues. Other artists continue to homage these covers to this day, which is always the ultimate testament to an illustration’s influence. And despite the fluffiness of the series, there are a few moments that have gone on to have a long-term impact on the comic book industry. At the end of the series, The Thing, who has mysteriously been transforming back and forth between his rockman persona and Ben Grimm, decides to hang back on Battleworld to figure some stuff out, leading to a period of Fantastic Four where She Hulk is the fourth member. 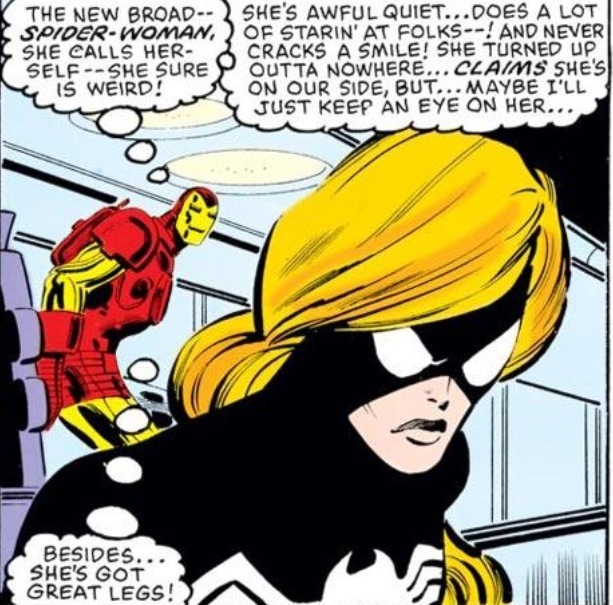 We get the first appearance of the second Spider Woman, Julia Carpenter, who also happens to have “nice legs” per the data collected by Rhodey’s Iron Man technology (or maybe that was just his own observation). But more than anything else – and of course as one of the web’s biggest webheads you know I would zero in on this – the series’ eighth issue marks the official first appearance of the alien symbiote. 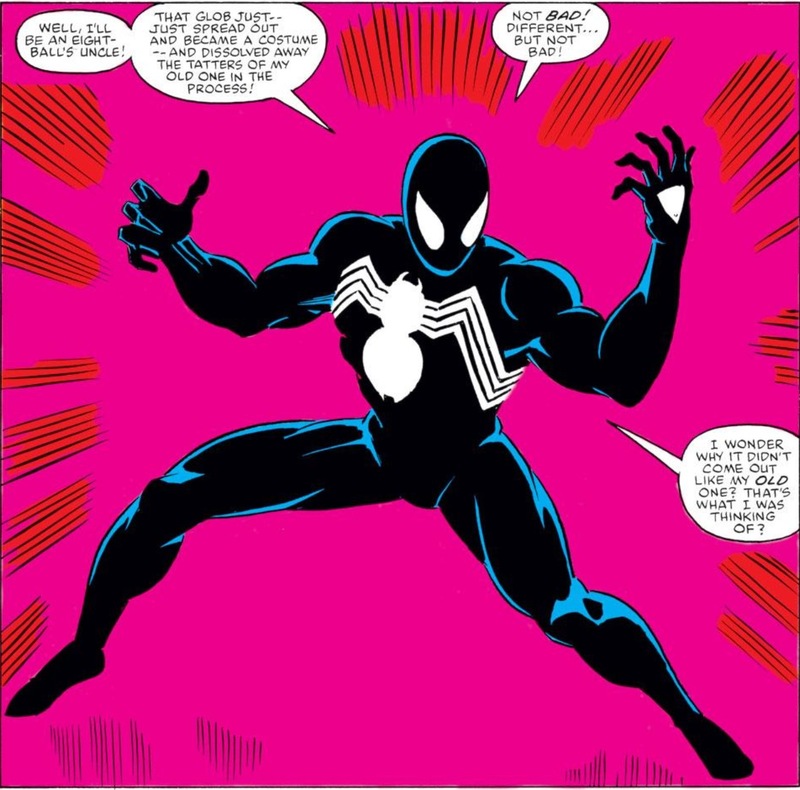 While it initially looked like this moment was just another gimmick to get Spider-Man in a svelte black costume (complete with action figure), the symbiote would later be used to create one of the most significant entries to Marvel’s rogues gallery over the past 30 years – Venom. Yes, as I’m sure most members of the cult of symbiote know, Venom’s first appearance wasn’t “technically” Amazing Spider-Man #300, but rather Secret Wars #8. I did in fact own this issue as a kid, but read it into a non-collectible pulp. I haven’t picked up a replacement issue because I’m more focused on using my (limited) financial resources to finish out my run of Amazing Spider-Man, but mark my words, I will come to own a nice copy of Secret Wars #8 at some point. It’s a must own for any fan of Spider-Man or Venom. So, just like it’s futile to tell an NYC tourist to not waste their time and money staring at wax figurines at Madame Tussauds (and seriously, why are you eating at a TGIF’s when you’re in the culinary capital of America? ), don’t expect to ever get me to change my opinion on Secret Wars. 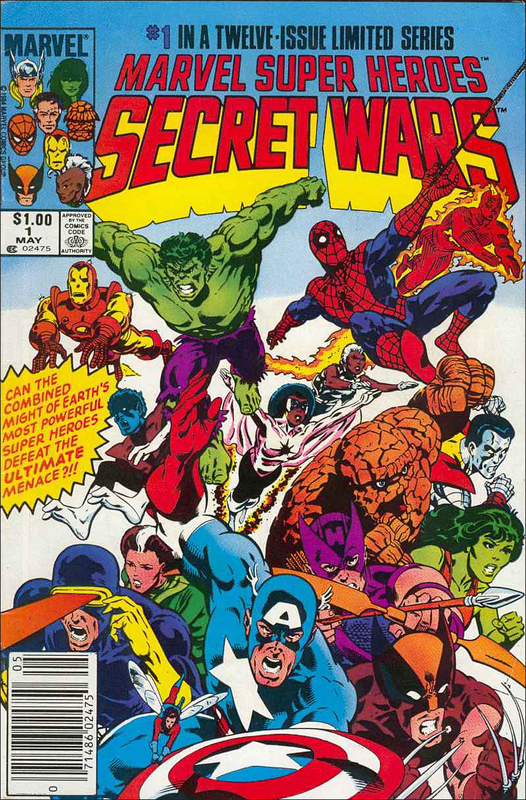 You’d essentially be arguing with a five-year-old, which is analogous to my mental state of comic book euphoria every time the words “Secret Wars” are so much as whispered around me. The series is just a demonstration of how hopelessly subjective our opinions about comic books can be. Thanks to Mark for this week’s blog! Be sure to visit him at the all-new Chasing Amazing! NEXT WEDNESDAY: It’s my big anniversary issue … #100 Top Ten One Hundreds! Mark is the co-host of the Superior Spider-Talk podcast and the founder/editor of the Chasing Amazing blog. Posted on May 8, 2013, in Conspectus and tagged Bob Layton, Doctor Doom, Jim Shooter, Kang, Mike Zeck, Secret Wars, Spider-Man, Symbiote, Venom. Bookmark the permalink. 40 Comments. I did think this series was fun (though I was 15 when it came out) though like Contest of Champions and Crisis on Infinite Earths, it led to bigger and worse things, but as a standalone series, I can still dig it. Dave, I can’t really think of the “worst” things that came out of SW. If anything, my biggest complaint was beyond the black suit/Venom, nothing much of consequence came out of it. It was just one big marketing ploy for toys. The series originated as Marvel’s contribution to a new toy line launch at (I think?) Mattel. The toys ran late but the comics went on as scheduled. Considering its origins I think the series is pretty decent. It had a couple things in its favor. It rode an early wave of enthusiasm in the direct market for mini-series, and it was practically unique in offering a big “event” crossover. This was well before mandatory-event fatigue set in. Marvel was also wise to position the whole series as a flashback. 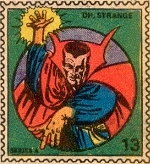 The event occurred “between months” in the Marvel Universe. One month, all was normal, and the next Spider-Man was in a black costume and the Thing had taken a leave-of-absence from the Fantastic Four. The characters suddenly had this shared secret history but the readers were out of the loop — you felt like you just HAD to read Secret Wars to figure out what had happened on that mysterious Battleworld. 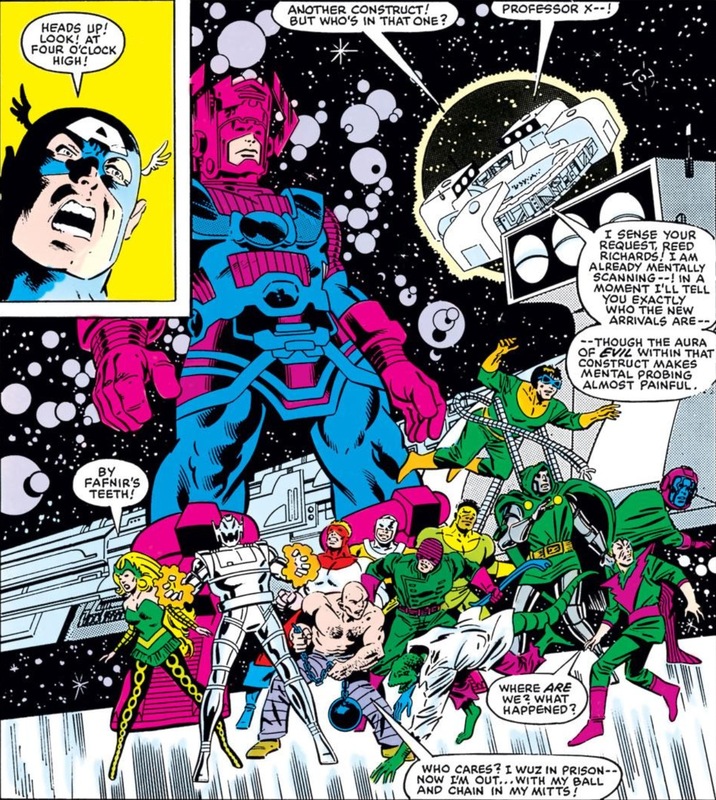 I also don’t recall a lot of mandatory cross-overs and pollution of the main line from Secret Wars — it really was the oppositie of today’s mandatory summer events. I think one bad thing that came out of SW was Secret Wars 2. Seriously, one thing that annoyed me about SW2 was the forced crossovers into mainstream titles. I remember thoroughly enjoying a story arc in Avenger where Captain Marvel is stuck in another galaxy by herself, and using her wits to survive, when the Beyonder show up and fixes everything with the lbink of an eye. Argh! The other thing that could be seen as a negative result was the proliferation of miniseries in the mid-80s (everybody and his brother, down to the lowliest D-lister, had his own miniseries) which was spurred on by the success of Contest of Champions and Secret Wars, cool as those series were on their own. I see what you mean. I thought you were talking about some new, less than desirable status quo changes it implemented. And the only two significant ones I could think of were Spidey’s black suit/Venom, which by all accounts is one of the most successful payoffs commercially and critically in modern comics history and She Hulk of the FF, which I honestly can’t speak of because I didn’t read much FF during the no-Thing era (in fact, I remember not picking the titles off the spinner rack because as a little kid, I didn’t understand where the orange rock guy from the cartoons wasn’t there). That explosion of mini-series also had a lot to do with market conditions (a new direct market hungry for novel content) and the legal necessity of keeping trademarks fresh by using inventory characters in print once a decade or so. Not very romantic, but that’s how the sausage is made. Gotta take the good with the bad when it comes to mini-series of the 1980’s. You get some clunkers, but some (Punisher & West Coast Avengers immediately spring to mind) led to characters getting long ongoing runs and prominence hat could never have just gotten an ongoing out of nowhere. Plus, some of the greatest critical achievements of the era (Watchmen, DKR, Camelot 3000, etc) were mini-series. WE don’t get those great stories w/o the proliferation of this format. The Limited Series was a child of direct market distribution, and permitted some experimentation … and also an easy outlet to get a character’s title into print, keeping those trademarks and copyrights fresh. Win/win, I guess. I did find that precious few mini-series survived my great Purge, but that probably has more to do with diminishing interest in the era than it does with the quality of the work itself. I do wish the format had been around for some earlier series, which would have benefitted from the format (thinking of Kirby’s Eternals, first among many). I love Secret Wars! Spot on write up too. What’s not to like the series had it all and then some. Except Kang got a raw deal. Now I will have to re-read as I don’t remember what happened to Kang at all. I recall Doctor Doom getting his dress blown off, but that’s only because of the cover. What’s funny is Kang must have been one of the most over-produced figures from the series one line, because I remember seeing them everywhere (and of course owning one) to the point that it wasn’t until I re-read recently that I remember Kang bites it very early. How does that happen??!! Remember there are many versions of Kang echoing through the centuries, perhaps this accounts for his many toy appearances. I walk through Times Square every day. The parade of Elmos drives me crazy. My fondest Secret Wars-related memory is of my dad buying the Captain America figure for me at Toys R Us one day. I don’t remember the reason, just being so exited to tear that package open in the car. Comics don’t always reach us as comics. My own first real contact with comics was building a plastic model of the Hulk in 1974 or so. The model came with a little comic, somehow that helped legitimize the notion of buying a comic for its own sake. Now I am nostalgic for Hulk! 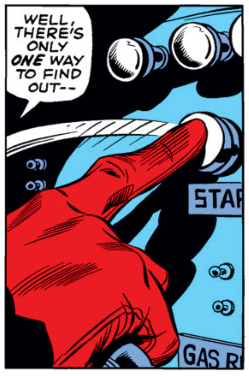 Prior to that kit I expect early seeds were planted by 1960s Marvel animation. I expect many present readers were first exposed to superheroes through cartoons. Eventually we will have a generation of readers broken-in by the movies (in the best-case scenario). Great story! Y’know, that would make for a terrific post, soliciting readers for how they became fans. While the Secret Wars Cap action figure was part of the tapestry that wove its way into my geeky life, I think most of the credit goes to the goodie bags at my cousin Jeff’s birthday. I was three or four, and so upset that I got Care Bears #5, while my older cousins each got issues of GI Joe. My mom went out and bought me a GI Joe Special Missions #2 and that was the beginning of the end for me… I’ve also just shared the only two times my parents bought me something for no reason. I don’t want people thinking I was spoiled. I swear they beat me all the time, too! If they beat you with a bag of gummi bears while laughing like the Joker then we’d have your secret internet icon origin, right there! I think you should stick to that story, myself. Um… Yes! How did you know? Oh, it was horrible! All great art comes from pain. Paul, I’m sorry, but I detested the Secret Wars. It seemed too contrived. It seemed to me after Shooter and Star Wars, all Marvel was about was making money. Dr. Octopus on an alien planet? It was like they didn’t respect anybody’s intelligence anymore. I thought, with D.C., they handled it much better, and they put out much better comics for years after that, much to my surprise. Well, this was an apologia … and it was also a guest blog from the very talented Mark Ginocchio, who encountered Secret Wars at a tender age, and we all know how things impact us when we are young. My personal opinions of Secret Wars are more muted — I haven’t read it since first publication, I really have no idea what I’d think about it now. Back in those simpler times I remember being intrigued by the premise — especially as the whole event occurred in-between months and you felt you needed to read the series to find out what was going on. One moment Spider-Man is normal, the next he has a black costume; suddenly the Thing isn’t in the F.F. any more, etc. — I thought that was a clever way to frame the series, and it didn’t pollute a whole summer’s worth of books with cross-overs, either. At the time I liked Crisis better, too, but with the wisdom of thirty years’ hindsight, I’ve come to detest Crisis … not because of the story and art (which I remember as being very good), but because of the ultimately unwise changes it made to DC’s universe, sucking out much of the fun, and leaving behind a broken, less-magical thing that DC has been trying to fix ever since. 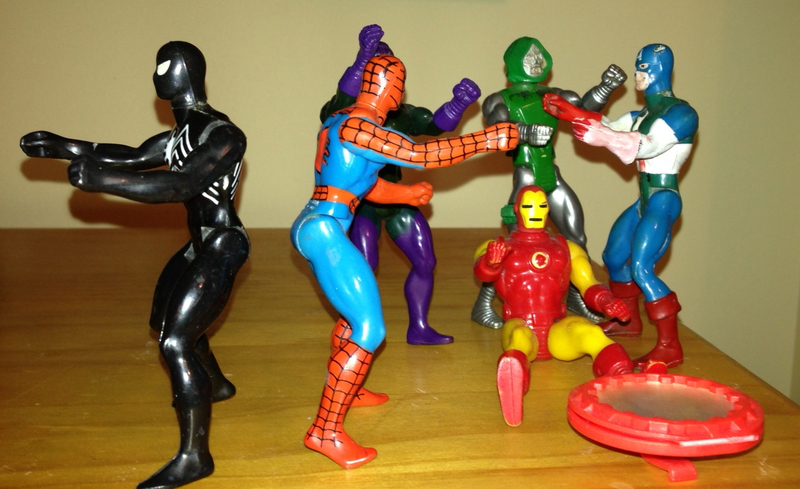 Secret Wars, being little more than an instruction manual on how to play with your action figures, did less harm, and so in the long view might be considered the better event, but that is an admittedly perverse way to look at these things. It is all very confusing. It is one of the reasons I prefer to reside in a perpetual 1978! You can’t unscramble an egg. I’m still building up my resolve to break Secret Wars and Crisis out of their containment vessels for a re-read. Haven’t experienced either series since their original run. Like this writer, Secret Wars was maybe the first comics I ever collected. I never knew it was considered gimmicky or a joke though. To me as well, it was an introduction to all the big names (heroes anyway) and a fantastic story with good drama. Bad guys were pretty lame though. 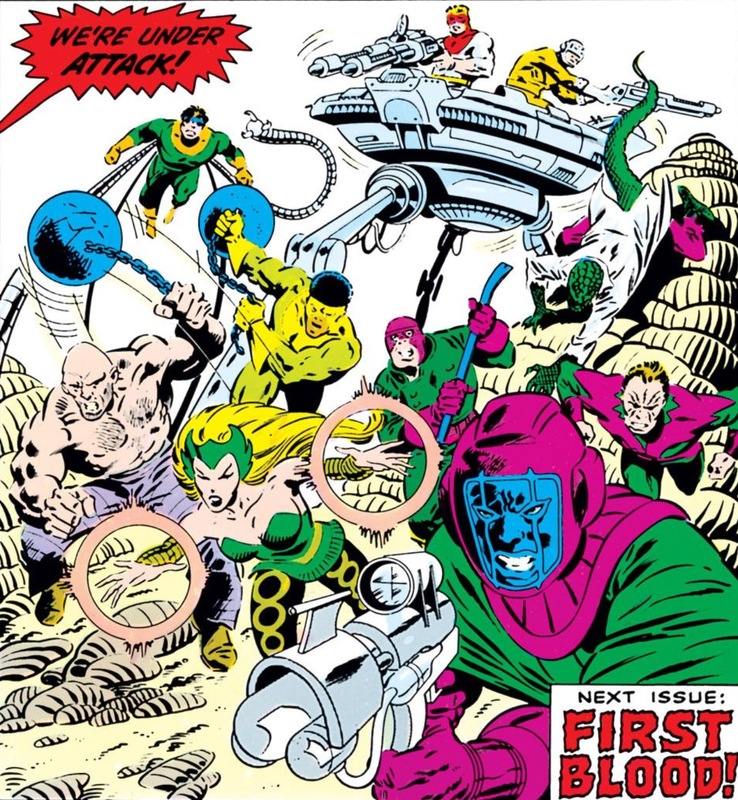 I did like Klaw, Molecule Man and Kang though. Too bad that last one got chumped out toot sweet. And of course Doom, who got hisself torn apart but still one-upped The Beyonder! Issue #10 still one of my favorite covers of all time. With the ease of conjuring issues of yesterday on digital apps, or probably in your local comic shop’s sale bin, if you have the means I highly recommend picking this up. It’s so choice. The Secret Wars toys, Spider-Man & His Amazing Friends, Incredible Hulk cartoon, and Super Friends were my first exposure to anything superhero related. I had Kang, Cap, Magneto, and Doom. I loved those things, and despite being 5 when the toys came out, held on to that captain America toy for at least 6 or 7 years. The series itself is a fun romp, and I have to say Mark, that the way you feel about Secret Wars is how I feel about the 90’s era. People can spit on it all they like, but that’s a magic time tinted rose by my age and new exposure to superheroes as a young man. I love it, and I always will! I thought the whole concept was a masterstroke, at the time, and I eagerly read the series. I have since sold it on and I don’t think it ever got a second read … another book for the never-ending digital pile.